This recipe may break the convention of what being able to cook while camping. 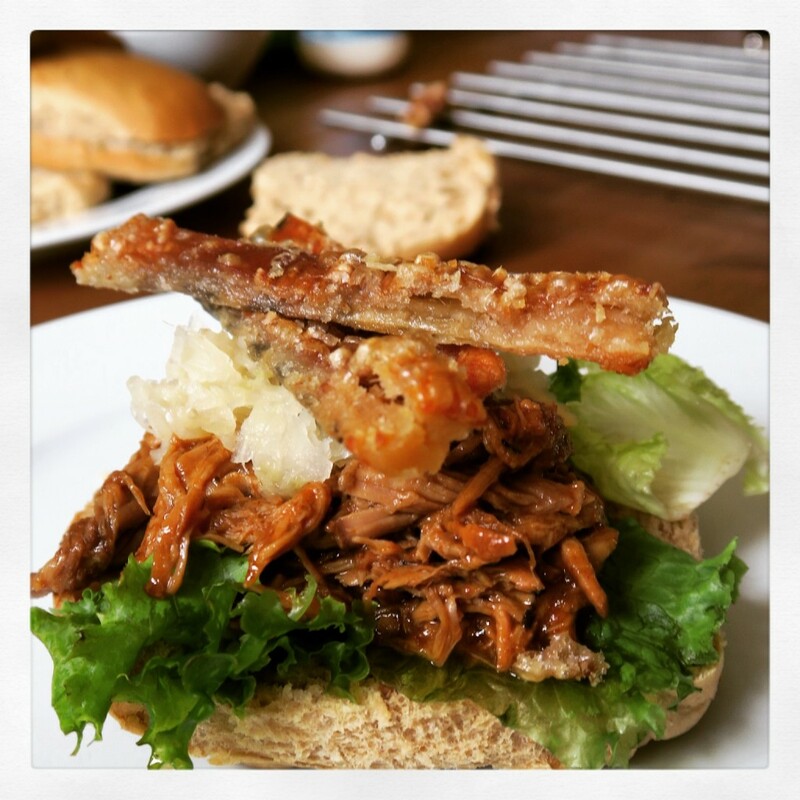 In fact we cooked this pulled pork in our slow cooker at home, but as you will see you can in fact cook this well in advance and simply warm up when you are al set up on site. – We plan on doing just this when we go for our big family get together later in 2015. This recipe is a perfect one for when there are many mouths to feed, you’re having a bit of party – or just incredibly hungry. The preparation can be quite time consuming but I can assure you it is worth it. To prepare the meat – remove any string or netting. We bought ours from the supermarket, so it had string holding the boneless joint together. If your roasting joint has come with the skin on, remove this along with most of the fat too. Place the meat joint into the slow cooker and move onto the cooking liquor. Add the BBQ sauce, Vinegar, chicken stock, sugar, mustard, Worcester sauce, chili thyme, garlic & onions together. Mix well and pour over the meat. 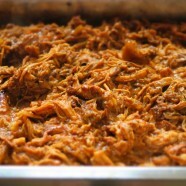 Set the slow cooker on low and cook for around 6 to 8 hours or until you can pull the meat apart with a fork. At this stage remove the meat – allow it to rest for 20 minutes and shred with 2 forks into a bowl. Spoon some of the cooking liquor back over the meat until the mix is not too wet, but is nice and moist. You can now leave this to cool for another time, or eat straight away. We served ours on a whole meal bun, with some of the reduced cooking liquor, some sauerkraut and we cooked up the removed skin to turn it into crackling.